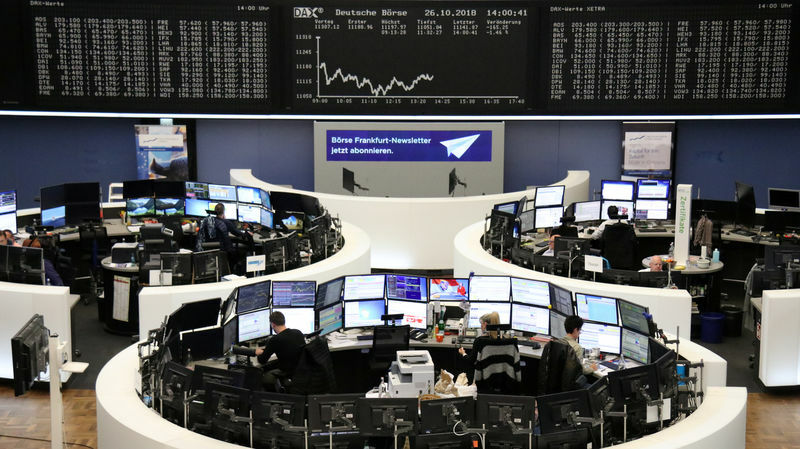 LONDON (Reuters) – European shares, set for their worst monthly performance since August 2015, opened in positive territory on Monday in a tentative rebound from a sell-off which has depressed them to a level not seen since December 2016. At 0957 GMT, the pan-European STOXX 600 () was up 1 percent with most bourses firmly in the black with U.S. stock futures turning positive despite worries about China’s slowing economy previously weighing on Asian shares. “European markets enjoyed a stronger start to the week, despite a sell-off in China as investors digested the impact of a trade war with the US on industrial earnings”, said Russ Mould, investment director at AJ Bell. The banking sector () was the best-performing one, up 1.8 percent with HSBC (L:) rising 4.5 percent after Europe’s biggest bank by assets posted a higher-than-expected 28 percent rise in third-quarter profit. On the other hand, Spain’s state-controlled Bankia (MC:) was down 4.7 percent after posting lower than expected Q3 results. Italian banks shone after rating agency S&P kept its credit rating two notches above non-investment grade for Italian sovereign bonds. Banco BPM <.bami.mi> shares rose 3.3 percent, Ubi Banca (MI:) 3 percent and Unicredit (MI:) 2.5 percent. Milan’s FTSE MIB () posted the best regional rise, up 1.2 percent while London’s rose 0.9 percent with investors waiting to learn more about Britain’s 2019 budget and what impact it might have on individual companies. Frankfurt’s () accelerated its gains to 1.3 percent after a senior party source said German Chancellor Angela Merkel would not seek re-election as party chairwoman at a conference in early December. The open of Paris CAC 40 () resumed after being delayed due to technical issues and was up 0.3 percent. Another strong performing sector was healthcare (), up 1.7 percent with Novartis (S:) adding 1.9 percent. The Swiss group and Pfizer Inc (NYSE:) PFE.N are teaming up to develop treatments for a liver disease many drug companies believe will become a hugely lucrative market, as it is tied to the obesity and diabetes epidemics.